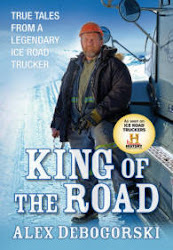 Alex Debogorski 2010 King of the Road Book Tour: BOOK SIGNING IN HOBOKEN NJ Oct.22!! Alex will be at John Wiley & Sons Friday October 22 in Hoboken, New Jersey from 12pm-2pm at 111 River Street for a book signing. Come out and see the Red Giant and meet this trucking titan!